One hundred years ago, draft horses clip-clopped on nearly every street and dusty road in America. From their enormous strength came the term “horsepower.” They helped plow fields, pull carriages full of people, and haul wagonloads of milk. In winter, summer, spring, and fall, these huge yet gentle and intelligent animals worked tirelessly with their owners – and continue to do so today, although in far fewer numbers. 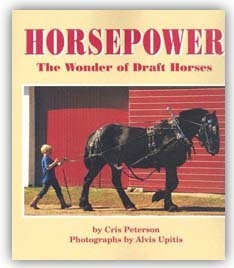 Cris presents three breeds of draft horses – Belgians, Percherons, and Clydesdales – and the families who care for and work with them. Alvis Upitis’ striking photographs capture the horses at work and at rest, in shows and in parades – effectively illustrating the unique relationship that often develops between humans and horses.